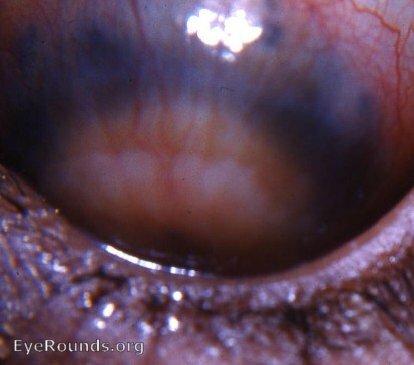 Profound anterior segment pathology frequently follows a perforating corneal ulcer. The photograph presents anterior ectasiae/anterior scleral staphlomata. The differentiation of the ciliary staphyloma seen in the photograph lies between two types,i.e. ciliary staphyloma or intercalary staphyloma. It is frequently difficult to make the exact diagnosis clinically. The pathologist on anatomic study and microscopic study of the enucleated eye will be able to make the exact diagnosis.